Are Public Schools Looking For A Rent-A-Dad Program? | Blackinformant.com Xtra! 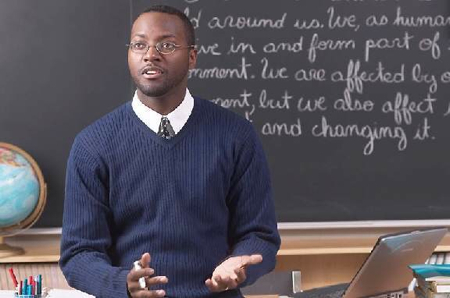 For years we have all hearing about the shortage of Black male teachers in our schools and the adverse effect it is having on our children. Personally I never bought into this notion because as a person who had mostly female teachers throughout my schooling days, I turned out just fine. As far as male role models go, my dad always made himself available to my teachers and was there to encourage me when he knew I wasn’t doing my best. I also had an uncle who took me to work with him one day. He was the head of the computer department for his company at that time and it was that visit that helped me to decide on my future career in computers. He also gave me one of his old computers on which I taught myself BASIC. Thinking about this article this morning (Hunt is on for more men to lead classrooms), I could not help but to recall just how for a good part of our history, the teaching profession was actually considered the career of choice for women. The setting of the above article is in a Boston-area public school. Coincidentally, I came across a passage in the book “The Female School Teacher in Ante-Bellum Massachusetts, by Richard M. Bernard and Maris A. Vinovski” that proves my point regarding the role of female teachers. Now from what I know from history, I do not recall ANY major crisis discussions over how men were desperately needed to teach children in the classroom. So let’s tell the truth here for a minute. The public school system knows full well that what cripples many of these children isn’t the lack of male teachers in the classroom. IT IS THE LACK OF A CONSISTENT AND STRONG MALE PRESENCE AT HOME. While I totally get that many of our schools are forced into this situation by absentee parents, is recruiting men to play the role as both teacher and parent fair to these men? well i think you actually have a couple distinct things running concurrently there. re: teaching as a “female” occupation, let’s remember that the 19th century wasn’t quite like today where there was relatively equal choice about what jobs to take. women were steered into teaching because there wasn’t much else a woman could do if she’d had schooling. moreover, teachers’ wages in many places were set at a level with the expectation that the teacher was working while she lived at home with her parents, and that once she married, she would stop working and live at home with her husband. that wage level, particularly in that time period, would have been enough to prevent many men from entering the field, since it would not have been enough to provide for a family. second, i don’t know about your schools, but once i got to high school, the majority of my teachers were men. i think the only classes for which i had a female teacher for more than one year were english, and ironically, gym. but i definitely feel you on the surrogate fatherhood. in some cases, it’s can be exacerbated in a coaching relationship. sometimes even the parents (both) can expect you to be the parent (a/k/a bad cop) in terms of telling the child they can’t play because of homework, etc., when obviously it’s the parent’s job to keep up with what their child is doing. If you go back even further (like in the early 19th century on back) it was men who were primarily teachers. My point here is that despite the surge of women in later decades, apparently there was no major concern over how the lack of men was having a negative impact on the children. We are only hearing about that in this day and age because it is a major issue in the home.